I really have a thing for realistically asian sculpted dolls and was wondering if anyone knew of a company that did sculpts like that? starstruck will never grow up. The most asian faces I've seen amongst the "smaller than Yo" tiny set is the Elfdoll tiny Moneami sisters, Min Del Re, Jin Dal Re, and Bong Sung Hwa. They're very tiny, about 5" tall, but have an adult build...good dollhouse scale. They're always popping up on the Marketplace, and some of the former Elfdoll distributors like Denver Dolls may have some still available. There's also Doona Soah, also from Elfdoll, who is a smaller-scale Soah in the Hana size...she shows up less often in the MP, but I know you can still get her from Elfdoll. Unfortunately, to buy one new, you have to be a member of Elfdoll or know someone who is to order, and they're not always available (although you can order Doona at the moment) since their ordering is on type cycles. I'm not sure if she's Asian, but Narin doll Bandy (http://www.dollfair.com/firefly.htm) is rather realistic in sculpt and has a good scale if you're aiming for a small child. The Elfdoll Sooah, I think it is, would be a great example in my opinion. Let me see if I can get a picture for you..
Elfdoll Soah is a great example of what I'm talking about(Mitya beat me to it XD). She has the perfect eyes! And this is also one the reasons why I fell in love with MD Alk, he's a tiny from Soom and the form of his eyes are very Asian-like with black eyes and black hair he would be perfect if you want a Japanese, chinese etc character. 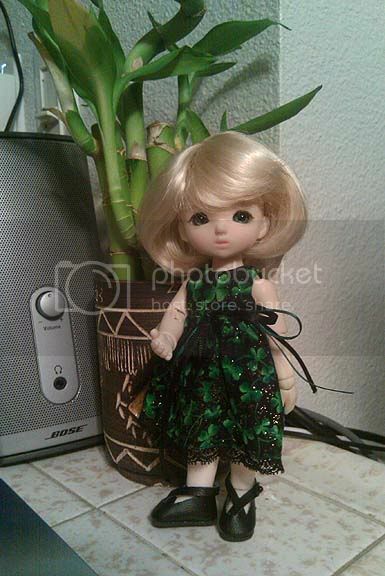 Don't know that you have an elfdoll account, but they made a new tiny that is a mini-Soah, and she's flippin' adorable! She's 20cm, so smaller than the standard Yo-SD (Around Petite Ai size? ), and she also has a smiling and 'reminiscing' (sleeping) face plate.